 Alfred Hartenstein (clerk, Adjutant-General’s Office). Alfred Hartenstein (clerk, Adjutant-General’s Office); Alvin Hartenstein (clerk). George B. Harrison (Keilholtz & Harrison). Alvin Hartenstein (clerk, Adjutant-General’s Office). Alfred Hartenstein (clerk, War Department). Joseph F. Eckhert (lithographer, Geological Survey). Joseph F. Eckert (Geological Survey). Florence R. Benedict (teacher); George W. Tayman (superintendent). George W. Tayman (insurance agent). John C. Hesse (Pension Office); George W. Tayman (clerk). Michael F. Gallagher (physician); Catherine M. Gallagher (clerk auditor, War Department). Frank N. Gallagher (physician); Michael F. Gallagher (physician); Catherine M. Gallagher (clerk auditor, War Department). Catherine M. Gallagher (widow of Michael F. Gallagher). Catherine M. Gallagher (clerk auditor, War Department); Mark L. Kilbourne (actor). George E. Knapp (private secretary, Hon. J. W. Good). Samuel S. C. Chilcote (clerk, Senate; rooms); Edith H. Day (clerk, Woodword & Lothrop; rooms). John W. Watts (skilled helper, Bureau of Engraving and Printing; rooms). Charles S. Draper; Paul A. Draper (messenger); Anne Moulden (servant). Charles S. Draper (messenger, Senate); Paul A. Draper (messenger). Charles S. Draper (messenger); Paul A. Draper (Bureau of Printing). 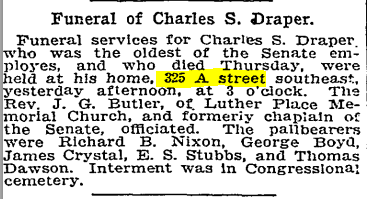 Charles S. Draper (messenger); Paul A. Draper (engraver). Charles S. Draper (doorkeeper, Capitol); George S. Draper (page); Paul A. Draper (clerk). Charles S. Draper (messenger, acting assistant doorkeeper, Senate); George H. Draper; Paul A. Draper (photographer). Charles S. Draper (messenger, acting assistant doorkeeper, Senate); George H. Draper (messenger). Charles S. Draper (messenger, acting assistant doorkeeper, Senate); George H. Draper (clerk); Paul A. Draper (engineer). Charles S. Draper (messenger, activing assistant doorkeeper, Senate); George H. Draper (assistant secretary); Hall [sic] A. Draper (electrical engineer). Charles S. Draper (messenger, acting assistant doorkeeper, Senate); George H. Draper (clerk). Charles S. Draper (messenger, acting assistant doorkeeper, Senate); George H. Draper (stenographer); Paul A. Draper (electrical engineer). Charles S. Draper (assistant sergeant-at-arms, Senate); Paul A. Draper (electrician). 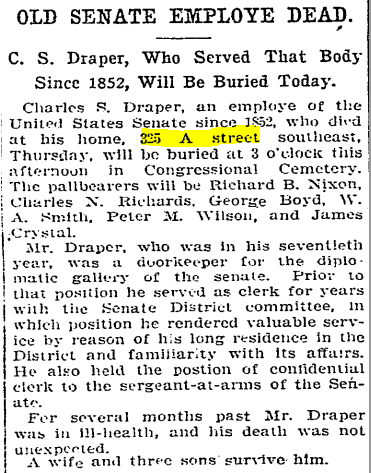 Charles S. Draper (sergeant-at-arms, Senate); Paul A. Draper (electrician). Charles S. Draper (doorkeeper); Paul A. Draper (electrician). Charles S. Draper (messenger); Paul A. Draper (electrician). Charles S. Draper (messenger); Paul A. Draper (electrical engineer). Charles S. Draper (clerk); Paul A. Draper (electrician). Charles S. Draper (doorkeeper); W. Albert Draper (student). Isabel Taylor (nurse); Charles S. Draper (doorkeeper). Isabelle Taylor; W. Albert Draper (engineer dist. ); Josephine Draper (widow of Charles S. Draper). Josephine Draper (widow of Charles S. Draper); W. Albert Draper (civil engineer). Josephine Draper (widow of Charles S. Draper); Paul A. Draper (electrician). William M. Powell (folder, House of Representatives); Isabelle Taylor (nurse). Josephine Draper (widow of Charles S. Draper). Josephine C. Draper (widow of Charles Draper); Isabelle Taylor (nurse). Josephine Draper (widow of Charles S. Draper); Isabelle Taylor (nurse); Charles A. Ehrhart (captain, police). Thomas H. Dugan (clerk, House of Representatives). Isabelle Taylor (domestic; checker, Washington Term[inal? ]); Thomas H. Dugan (clerk, House of Representatives). Isabelle Taylor (checker, Washington Term[inal?]). Washington Evening Star, 11 September 1908, p. 10. Federal census, 1940, 512 A Street, SE, Washington, D.C.
Samuel J. Hogan (rents, $43), head, 57, married, completed 7th grade, born in La., lived in New Orleans in 1935, union president, Manual [?] 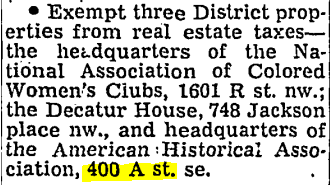 Engineers Association, worked 52 weeks in 1939, income $4,500. Laura E. Hogan, wife, 41, married, completed 12th grade, born in La., lived in New Orleans in 1935, not employed. Samuel J. Hogan, Jr., son, 11, in school, completed 4th grade, born in La., lived in New Orleans in 1935. Charles D. Hogan, son, 7, in school, completed 1st grade, born in La., lived in New Orleans in 1935. Robert L. Hogan, son, 6, in school, born in La., lived in New Orleans in 1935. Charles D. Wright, lodger, 25, single, completed 2 years of college, born in La., lived in New Orleans in 1935, general clerk, U.S. Senate Office, worked 26 weeks in 1939, income $700. 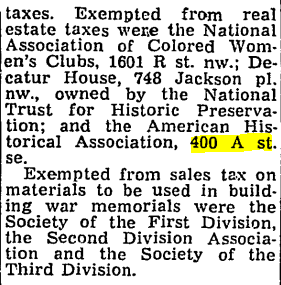 “Senate Unit Approves Police-Fire Pension Aid.” Washington Post, 7 May 1957, p. B1. 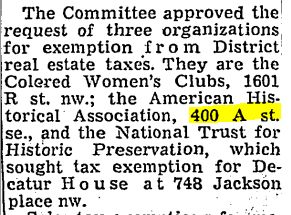 “3 Tax Relief Appeals Vigorously Opposed.” Washington Post, 11 April 1957, p. A25. Carper, Elsie. 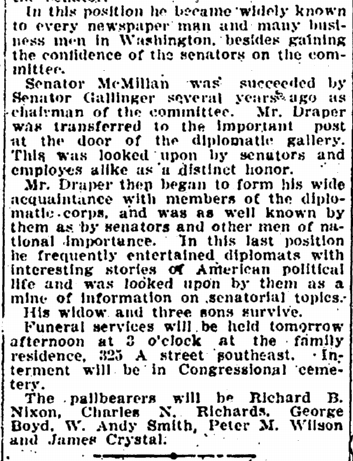 “Teacher, Police Retiring Bills Pass Committee.” Washington Post, 15 May 1957, p. B1. Bills approved by the Senate District Committee. Carper, Elsie. 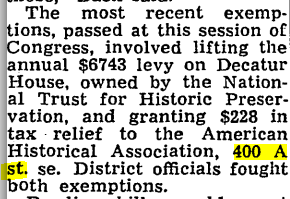 “Teachers’ Retirement Fund Boost Is Adopted.” Washington Post, 23 May 1957, p. A19. 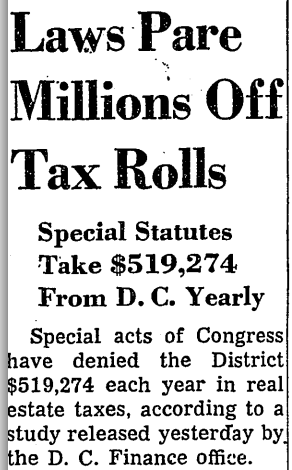 “Laws Pare Millions Off Tax Rolls.” Washington Post, 13 July 1957, p. B1. 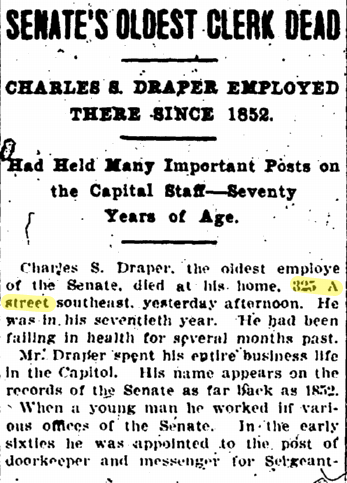 Washington Post, 12 September 1908, p. 2. 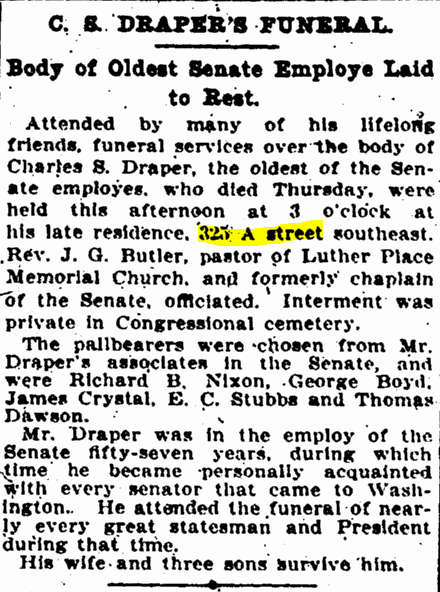 Washington Post, 13 September 1908, p. 16. Washington Evening Star, 12 September 1908, p. 16.